One of my favorite things to do, especially during spring and summer, is sit outdoors. I recently began improving my garden area, adding new flowers and décor, so that I could enjoy my evenings outside even more. One of the things that I plan to do soon is to add new lighting to my garden. I want to be able to see my flowers and plants, even at night, so I thought that I would look for some great DIY garden lighting projects that will do that, and I found 20 gorgeous DIY garden lights that will beautifully illuminate your outdoors. Whether you need lighting just long enough for a special event or you want something that will permanently illuminate your garden, I have just the DIY garden lighting projects for you. 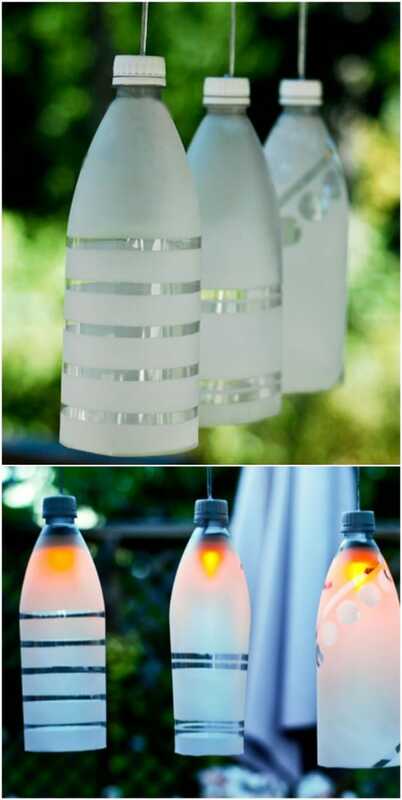 These are all so easy to make and you just won’t believe what you can upcycle to make gorgeous outdoor lighting. You know how much I just love a good upcycle project and this project list has quite a few of them. You will also want to check out these 18 DIY garden benches to add even more décor to your outdoors. I can’t wait to try out some of these outdoor lighting projects! I love working outside when it gets warmer and these DIY garden lights are definitely at the top of my to do list for this spring. Not only do they add beauty to your outdoors, they can help to improve your curb appeal and even increase your property value if you make them permanent. There are so many reasons to create your own garden lighting and I hope you’re as excited as I am to get started! And, be sure that you also take a look at these 40 easy DIY one day lawn and garden projects to spruce up your outdoors even more. I love these stained glass lanterns that you make from empty pickle jars. You could of course, use any jar that you have on hand, even those empty mason jars that you’re saving for a great DIY project. 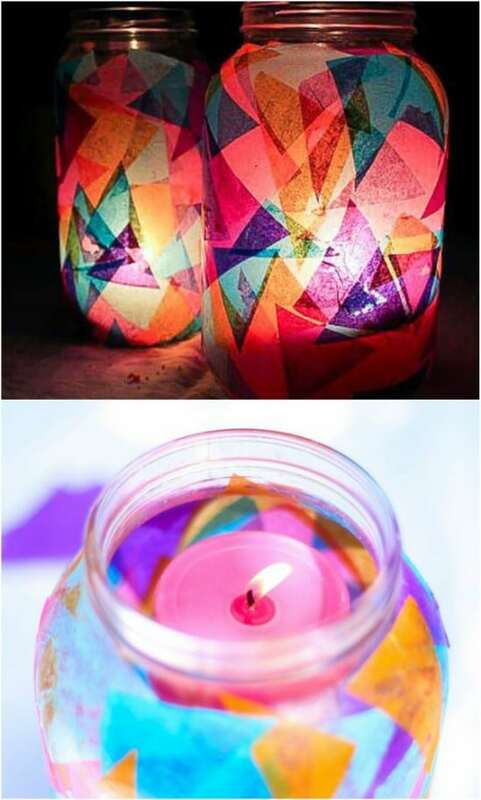 These are so simple – you just use tissue paper to get the stained glass look and then add a tealight candle to illuminate your garden with all sorts of beautiful colors. You can buy lights that look like these cupcake lights at IKEA, and spend way too much money on them, or you can make your own with actual cupcake liners. These are almost too simple and they are so adorable. You just need a collection of cupcake liners and some clear lights. Hang these on the porch or directly in your garden from stakes or trees. You really can make something out of just about anything. 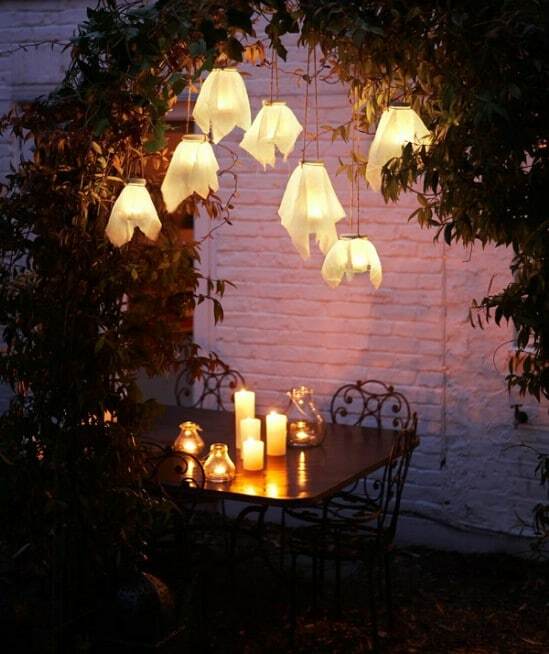 Take these lovely garden petal lights for instance. They are made with empty detergent bottles. You can use any number of plastic bottles to make these and once you have your supplies all gathered together, each one only takes about 10 minutes to finish. Put them on stakes and line your garden path with them! This is a great way to upcycle empty detergent bottles. I love things that glow in the dark, especially for the garden. These square glow in the dark planters are perfect for lighting up your garden path and they are super easy to make. You can make your own glow in the dark planters – in any size or shape that you want – by just covering a normal planter in glow in the dark paint. 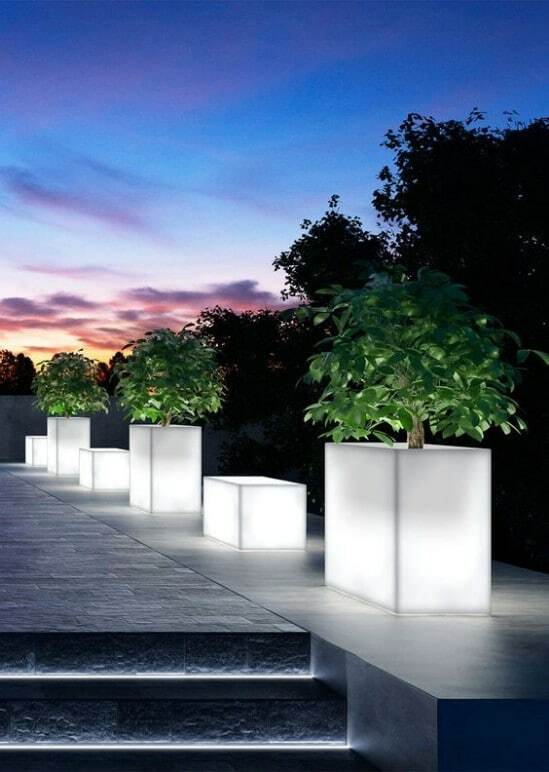 They’re simple and these square planters really give a great modern look to your outdoors. Citronella candles are perfect for lighting up your garden area. Not only do they give off a lovely glow, they help to keep away mosquitos and other flying pests during the spring and summer months. These DIY citronella candles are really easy to make and you can house them in empty tin cans or mason jars. This is a great project for upcycling tin cans and they’re really cheap to make, so you can have them sitting all throughout your garden. This garden gate not only gives you a beautifully rustic design in the garden, it also doubles as lighting. Once you have the gate built, you can just add clear lighting. The gate is really simple to create and it offers a beautiful farmhouse style that is perfect for giving your garden area a rustic look. This is as easy to build as it is beautiful to look at. 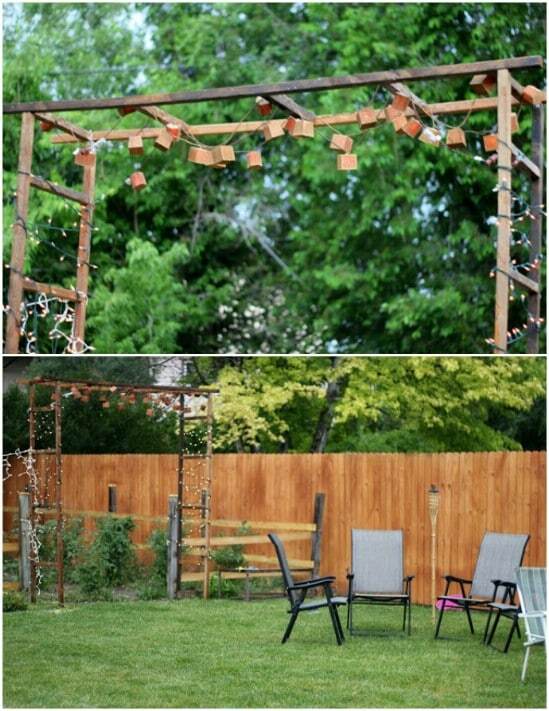 An old metal tomato cage is perfect for creating a rustic chandelier for your garden. And, this is a really simple DIY outdoor lighting project. 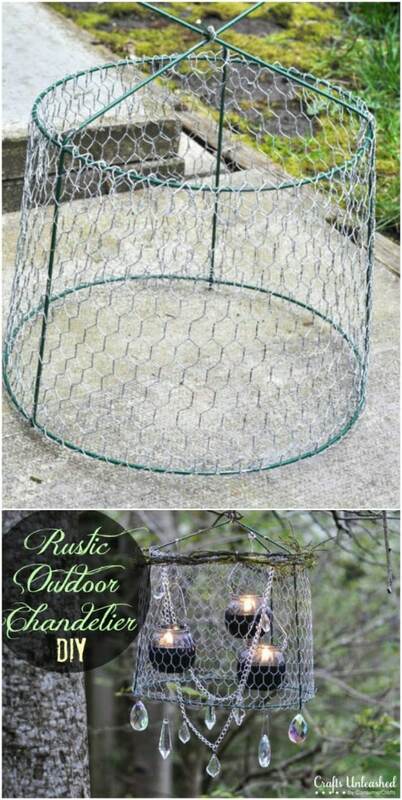 In addition to the tomato cage you will also need some chicken wire, a few trinkets for decorating and some candles. If you want easier lighting, I recommend those little LED battery operated candles or you can use real ones if you want the glow of a lit candle. What better way to light up your garden than with solar lighting? I love this idea of turning empty mason jars into solar lights and you can hang these from trees or posts or make your own adorable little shepherd’s hooks to hang them on. These can go anywhere…provided there is good sunlight to power them…and they are super easy to make. I just adore mason jar home decorating projects. If you recycle – I really hope that you do – you can take a few of those plastic bottles out of your recycling bin and turn them into these lovely frosted garden lights. You just trim the bottles down and then coat them with frosted spray. This is so easy and they make such gorgeous outdoor lights. 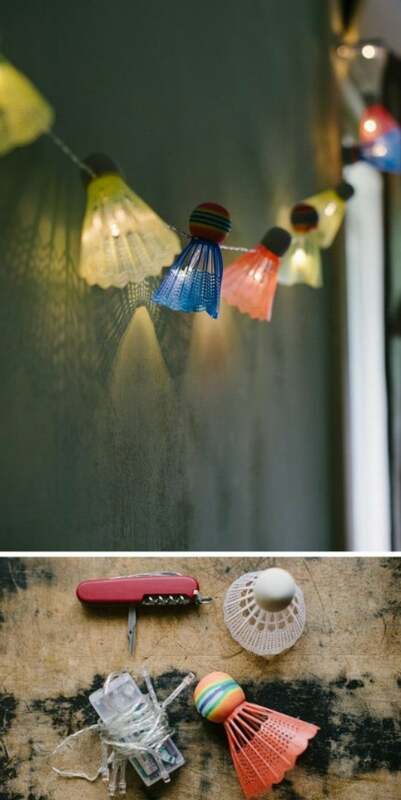 And, what a wonderful way to upcycle those old plastic bottles. These rattan balls are so adorable and elegant and easy to make or you can buy them online for under $30 for a set. Once you have the balls, you just add your clear string lights. You can hang these in the garden, line your porch or deck or you could even use posts to string them up along your walkway. 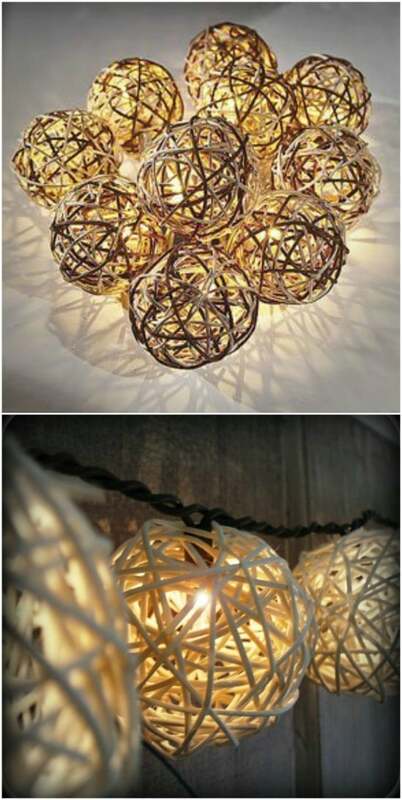 They’re very versatile and so gorgeous when they’re lit. These shuttlecock lights are so perfect for your outdoors. And, they are super easy to make. You do need a collection of shuttlecocks, but they are super cheap, especially if you check your local thrift stores. You can get several for a dollar if you buy them used. Once you have them, you just add your clear garland lights – or you could use colored lights if you prefer. Muslin is a very versatile material and if you happen to have some on hand, you can make these gorgeous muslin firefly lights for your garden or patio. 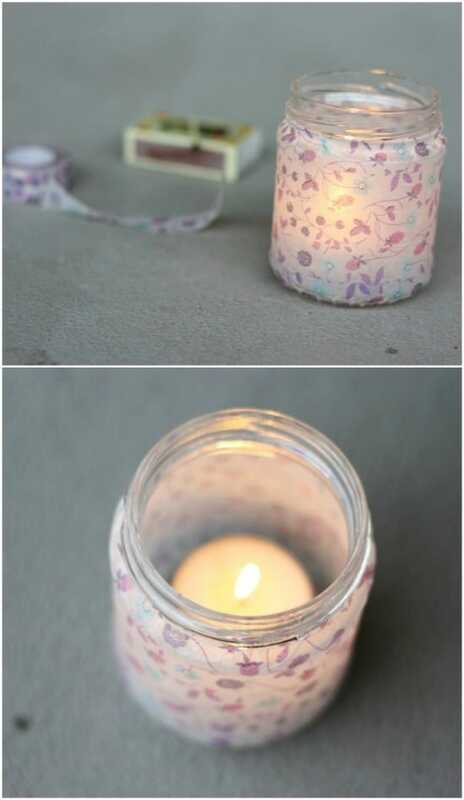 You just take strips of muslin and use them to create the lanterns using battery operated tealights. These are just gorgeous when they are finished and they are super easy to make – and really cheap, especially if you have the material on hand. This is a great way to repurpose scrap fabric. I love tiki torches, especially around the pool or in the garden. 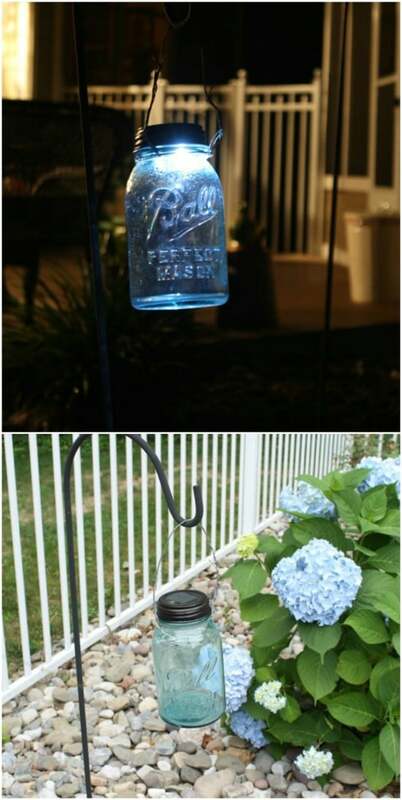 You can make these tiki torches with old glass bottles and some replacement wicks and tiki torch oil. They are the perfect way to light up your garden at night, especially if you want something that gives you a bit of a coastal feel. Just place them around the garden or you can put these on the deck or porch. 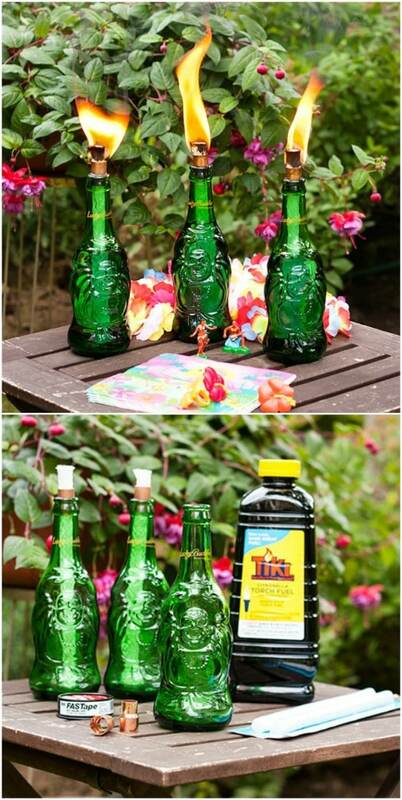 Who knew you could repurpose glass bottles into tiki torches? 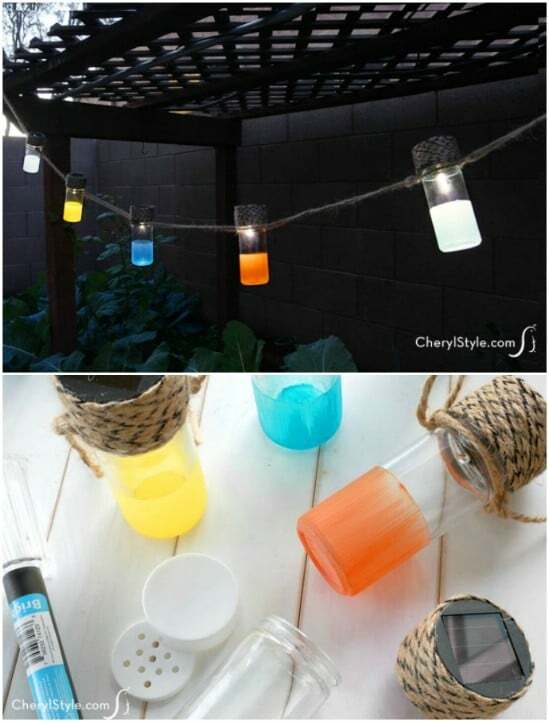 Here is another great idea for making your own solar lanterns. These use ordinary glass jars – you can get slim cylindrical ones from the Dollar Tree for just a dollar each. 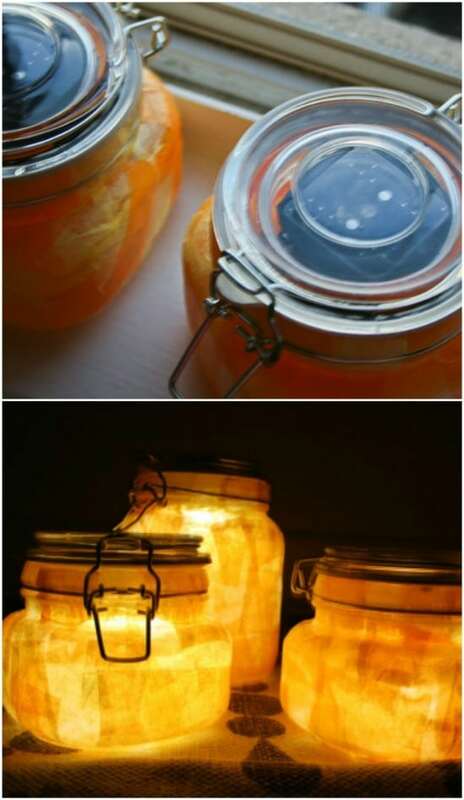 You paint the bottoms of the jars and then add your solar lights. These are so easy to make and the colors are perfect for summer and spring. You could also do these in red, white and blue to make them perfect for the Fourth of July. Not only does this DIY garden project light up your outdoors, it adds décor. 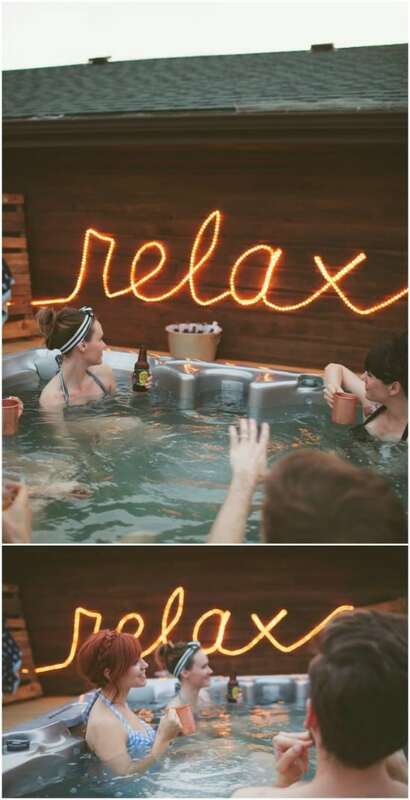 You can turn your rope lights into any sign or message that you want to display. This is so easy and it’s really quick to put together. You will need a strand – or two or more depending on what you want to say – of rope lights and then you just create your own message. This is a great light for the deck or porch. These little jars contain solar lights and they are perfect for the garden. You can buy similar lights at Urban Outfitters for about $45 per set, or make your own for just a fraction of that. Tissue or crepe paper make the sunny colors and then you just add a solar light. You can use any jars that you want, although I really love these container jars with the attached lids. These are great for sitting on the patio or anywhere in the garden. 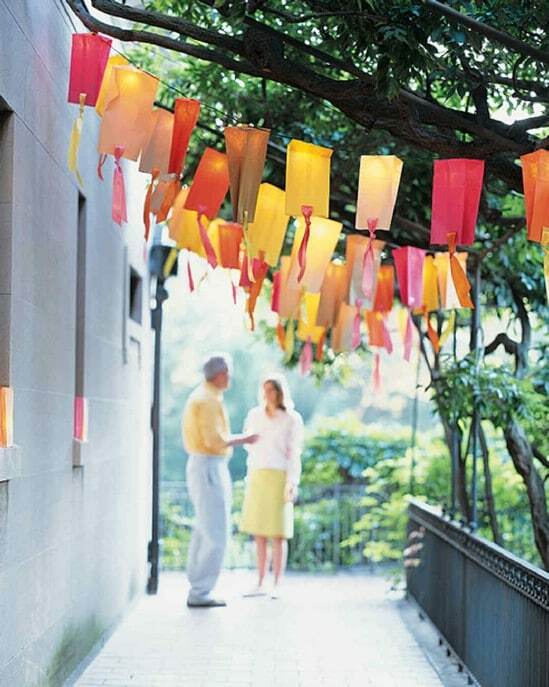 If you are planning an outdoor party, these ribbon paper bag lights are the perfect way to light up your outdoors. You could also use these all summer long as a decorative touch for your deck or garden. They are really easy to make and you can hang them over string lights or battery operated LED lights. You just need the lights and some colorful paper bags and ribbon to make them. 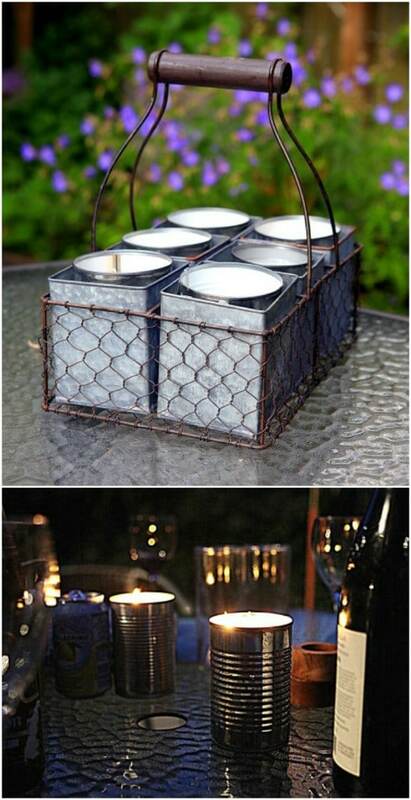 Turn those old empty tin cans into gorgeous little lanterns for your lawn and garden area. 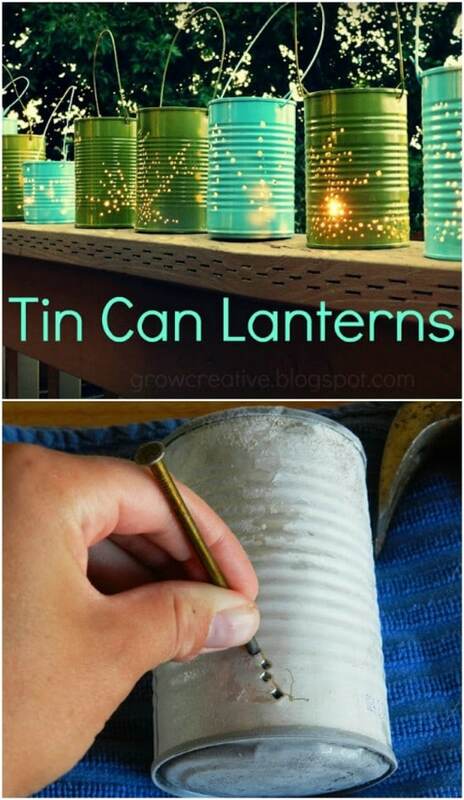 These are so easy to make and they are a wonderful way to upcycle tin cans. You can create any design in the sides of the cans that you want and the light shines right through the holes. You can use actual candles in these or use LED battery operated lights so that they shine longer. Upcycling tins cans can really give you some gorgeous home décor! 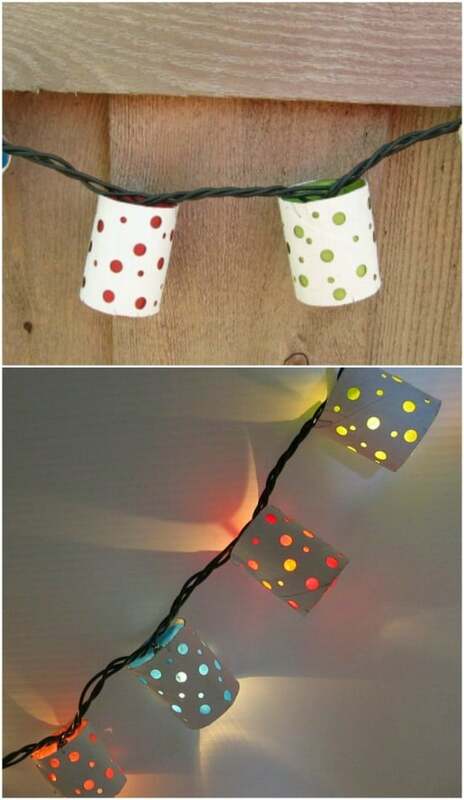 I love these polka dot lanterns and I really love that you can make these from upcycled toilet paper or paper towel rolls. If you are using paper towel rolls, you will want to cut them in half. Once you have enough rolls ready, decorating them with polka dots and putting your lights together is really simple. These are so perfect for adding some spring color to your outdoor garden. 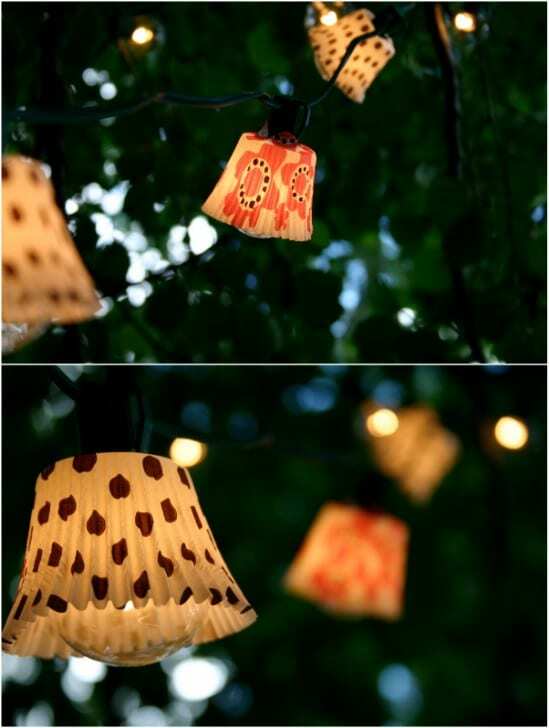 You can set these Washi tape lanterns all over your garden or have them on the deck for added outdoor lighting. They are so easy to make and are adorable when they are finished. Washi tape comes in so many different colors and designs. You just have to choose some empty jars and then cover them with tape. Then add your candles or LED lights to create beautiful garden lighting.